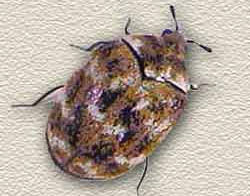 Varied carpet beetles are called such because of the pattern of color on the tops of their backs. Adult carpet beetles feed on seeds, plants and flowers while carpet beetle larva feed on carpet, wool fabric, dead insects, furs, hides, feathers, horns, hair, silk and bones of other animals. Carpet beetles are typically located in attic spaces, Oriental carpets, tapestries and wall-to-wall carpets. Carpet beetles can be problematic because a carpet beetle infestation can go unnoticed for lengthy period of time before a homeowner notices a problem. By this time, damage to upholstery, carpet, fabrics and materials has already been done. Heavily infested items may evidence of carpet beetle damage such as holes. AmeriGuard’s Pest Defense Service begins with a licensed technician providing a full inspection of your residence and property to identify the variety of beetle infestation and determine whether the pest is a General Pest beetle, Pantry Pest beetle or a Carpet Beetle. During the inspection, your carpet beetle control technician will identify potential problem areas around your home or office. After the source of your problem areas have been identified, your technician will point out other potential carpet beetle harborages and steps you can take to reduce future beetle infestations. Your technician will perform a treatment for carpet beetle service to take care of your carpet beetle problem. AmeriGuard treats for carpet beetles by using a combination of crack & crevice spot treating and area fogging to any material that may be fabric-based and thought to be infested with carpet beetles.